Attention! This is a world-class grain-free cookie. It’s chewy and moist with simple ingredients and NO refined sugars. You don’t even have to buy any crazy nut flours or starches. Yay for you! These are also great for a quick breakfast or post workout snack, or… you know… whenever. In a food processor, blend walnuts until fine dust. Add dates, egg, vanilla, baking soda, cinnamon and salt. Process until sticky batter forms. Add raisins and mix with a spoon or spatula. Bake at 325 for 15 mins or so. remove when tops begin to turn gold. Be sure to not burn them! These can also be made into a chocolate chip version. 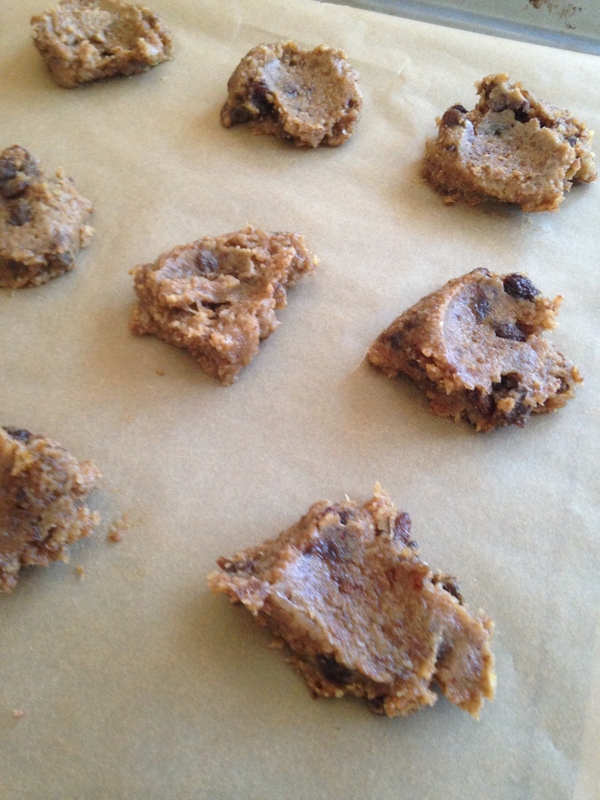 Just omit the cinnamon and raisins and add mini chocolate chips!